Unless stated otherwise, times (UT = GMT) and positions refer to the sky as seen from the location of Orkney, UK. Please go to the NOTICE BOARD. From there you will be directed to the appropriate page/s featruing latest entries to the site. We endeavour to cover astronomical topics receiving attention in the general media and elsewhere. We publish only our own observations wherever possible. The Orcadian Sky Notes is generally, but not exclusively, featured on the Active Sky Page. The observatory has been based on Rousay, Orkney, for the past thirty years. The two sites are separated by a distance of 8 km on roughly a SE-NW line and at altitudes of 47 metres and 122 metres above sea level. The routine work of the observatory is to monitor the visual condition (appearance) of the sky with particular reference to the aurora and (in summer) the noctilucent clouds. We also investigate features such as aircraft activity—the appearance of condensation trails—together with notable meteorological conditions. 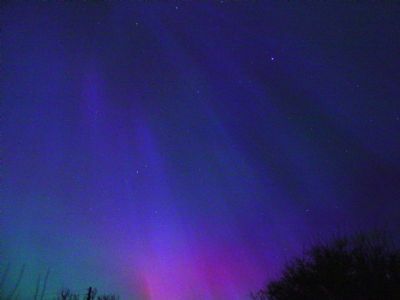 There is an archive of auroral images available through The Orcadian Sky Notes home page: go to the Links and Announcements pages of the Northern Skies site for further information. Visitors to the site will have noticed that we also routinely cover photographic work on COMETS and SUN (visible light—we receive notification from observers elsewhere in respect of flares etc.). In addition we make sporadic observations as appropriate on a number of ASTEROIDS, the PLANETS (specifically Mercury & Venus), the MOON, NOVA and some VARIABLE STARS. Remember, there are strictly no second chances in astronomy: if you miss an event, then that's it. Days, or even weeks may pass without anything spectacular happening, but the unexpected (such as an auroral display or sudden appearance of a fireball, sun spots and so on), can literally appear out of the blue. Constant vigilance is the watchword of the dedicated observer.